Who was Mary Boleyn? – Part 2: Mistress of two kings? When I asked for your questions about Anne Boleyn so that I could do a series of videos answering them, I also received quite a few questions on Anne Boleyn’s sister, Mary Boleyn. Fiction such as The Other Boleyn Girl, which was made into a movie and adapted for television, has made many people interested in Mary’s story. But it’s difficult to know where fiction ends and history starts. In my first video on Mary, I introduced the fictional Mary and then shared what we do actually know about her. You can view that video at https://youtu.be/Kg-1h6ttoJQ. In today’s instalment, I start to look at some of the myths and theories that surround this Boleyn girl, the idea that she was the mistress of two kings, Francis I and Henry VIII, and that her children were fathered not by her husband, William Carey, but by King Henry VIII. Excellent presentation Claire. Thank you for sorting through and making sense of a lot of information that has been muddled over the years. I must admit that I do see a resemblance between Catherine Carey and Henry Viii. That probably has to do with me looking for it rather than there actually being one. I am still laughing and crying over your reference to my comment about Mary’s bio by Alison Weir, which is a tome, although the paperback for some reason is slimmer. That will teach me to be sarcastic ha ha lol! Yes, of course her original bio is about her world and wider family and is very good, but there is a shorter one by Josephine Wilkinson which concentrated on more of what we know about Mary, so worth a look. I agree about the sources regarding Mary as the mistress of King Francis as he really was boasting, as some men of a certain reputation do, because they don’t want to look less sexually. At best maybe Mary slept a couple of times with a randy King Francis, but I doubt she was a whore or Francis mistress and what a nasty thing to say about her being his mule. I thought French men were meant to be gallant and protect the secrets of a lady. Not a very gallant thing to say. The remarks of Pio and others are fantasy. Mary wasn’t at Court in 1536 as far as we know but even if she was well Anne wouldn’t just have her around if she was losing her child. Other women were there. Everyone seems to have known about it. We have four contemporary sources. Would Henry have been so upset if Anne pretended to have a miscarriage to the extent that he was, mourning the loss of his son and Anne so vulnerable? No of course not! It was public grief and anger and despair and all very upsetting and Anne became more vulnerable and we know that Anne had a terrible loss of her baby so this thing about Anne pretending is nonsense. We have to remember the writers all had agendas to impugn the reputations of these ladies and the Boleyn family and were they are coming from and such writing was not unusual because people on opposite side politically often did this. 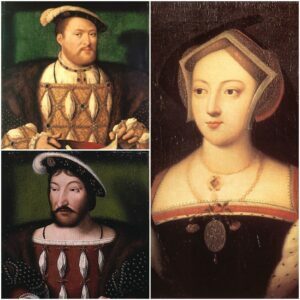 I agree that Mary Boleyn must have had a relationship with Henry Viii, but it was probably a short one because he asked for permission from the Pope to marry a lady who was related to another lady he had slept with. The analysis over the for and against evidence with regards to the fatherhood of the children of Mary and her husband, William Carey. Yes, of course we can’t say that grants and so on proves anything and as you said Anne made Henry Carey her ward to help Mary as William had left her financially stuck. Your examples show how common this was and unfortunately we don’t have any evidence that Henry Viii was the father of either Catherine or Henry Carey. I believe he was the father of Catherine because of a likeness and I think she did believe herself more than a cousin but that’s my own view. If Henry fathered a daughter he may not have bothered to publicly recognise them but felt some provision was in order. Fathering Henry Fitzroy showed he could have a son and his recognition of him was well known. Mary was also married so her husband was presumed to be the father. No Jeremy Kyle DNA tests in those days. Henry granted many people annuities and other payments. He was a rich and generous King and one rewarded loyal service. Women as well as men received grants from the coffers of the state and widows payments for their husbands. It was just like a widow now getting her husband’s pension. Here Thomas Cromwell has to be praised as he made certain that many women did. May I add that another myth is that Mary took Elizabeth from the palace and raised her thanks to the Other Boleyn Girl and every time it’s on its the same question from Steve about is it true. Well no. For one thing it would be impossible. We know Elizabeth had her own household and continued to do so with Lady Bryan in charge. But it’s a good bit of dramatic licence to end the film I suppose. You are quite right, Claire, there are more questions than answers and all those references, a lot of work has gone into this wonderful video. Thanks once again. I don’t know how you keep up with which series you are researching for. You are a very big star in my book. I wish we could get you presented with an honorary degree or fellowship. Come on all you academic institutions out there, never mind football stars, give this lady one. She deserves one. Professor Claire Ridgeway Hon Fellow in Tudor History and Specialist Doctor on Anne and Mary Boleyn. Ha! Don’t worry, it’s something that is always being said to me though in seriousness. Aw, you’re too kind! I do rather like the sound of that title. I just love Tudor history so although I’m burning the candle at both ends I’m loving it. And what’s brilliant about running a blog and doing videos is that I get instant feedback and can talk Tudor with people. I learn just as much from people commenting and sharing things as I do from my research. Thank you. You’re very welcome. It’s so lovely to see someone with your passion. I love Mary Boleyn because she is a bit of a mystery and because I actually think she did life her way and married a man who appreciated her for herself. Mary is the elder shadowy sister of her far more famous sibling but like her, she too has been slandered and has a rather defamatory reputation as immoral and rather loose in her habits, most of the time we do not know where she is and all we know is she was at France with Anne in the service of Queen Mary, then later Queen Claude and that she slept with King Henry V111 at least once when she returned to England, we know the date of her first marriage and she had two children Catherine who was her first born and Henry several years later, I too have read Weirs ‘tome’ of Mary and yes it is a large book and centres mostly around her family, she is a blank canvas and Claire is correct that novelists have a field day with her as we cannot say yea or nay on what is written, or shown in movies, there is no evidence that she was a whore but she may have slept with King Francis once or maybe twice, that does not make you a whore, she was young and enjoying life at France the most sophisticated court in Europe, when it’s King casts eyes in your direction you find it exciting and impossible to resist, a light love affair when young, or as Weir suggests it could have just been a one night should not damage ones reputation for life, but she was Anne Boleyns sister and therefore open to attack from Annes enemies, and years later the catholic recusant Nicholas Sander, the tale about Anne being sent of to France because she was over familiar with the butler sounds comical but it was damaging to her daughter Elizabeth 1st many years later, along with the other nonsense he said about her, and that Annes mother had also had an affair with King Henry, as Weir says that too would have been impossible as Henry would only have been around nine at the time, and whilst Elizabeth Howard was carrying out her duties in the service of Queen Elizabeth of York, the young prince would no doubt have been play acting with his swords in the palace grounds, did King Francis really make that ungallant remark about Mary, as Bq mentions it was not a particularly nice thing to say about a young woman who had shared his bed, the French were known for their flowery phrases they were the masters of gallantry, yet his remark is coarse and vulgar, maybe he said in jest whilst a bit tipsy but it seems to suggest he had a low opinion of her, his boast I do not think however was meant to make him appear a great lover in the eyes of his male courtiers because his promiscuity was legendary, and typical of the double standards of the day – the woman who slept with a man was light of living yet her lover was praised for his prowess, in fact the double standards still exist today but not as bad, maybe Mary was highly sexed and performed those acts which his other mistresse’s would not, he had a long term mistress and sired children with his queen, he prided himself on being a great lover and was not secretive about them at all, it was said Queen Claude tried to guard her young maids virtue from her rake of a husband and kept her own court away from his, his licentious living repelled her, Queen Katherine in England was far more fortunate in that her husband was very discreet, and this was because he held his wife in far more esteem than Francis did his, she may not even have known about his affair with Mary but certainly she did know about Bessie Blount, we can imagine her sadness when her son by the King was born, Bessie was married off and her son handsomely provided for by a grateful King, and here we can see a pattern emerging with Mary Boleyn, she also was married of to the Kings relative and friend William Carey and settled down to a life of demosticity, but we do not know when her affair began or ended, whearas Blounts had lasted for several years and was said to have been quite a passionate one, Henry was said to have been in love with her and sources state that she was blonde and beautiful and a graceful dancer, but when she fell pregnant the affair fizzled out and he had cast his eyes on Mary, around 1526 Anne had also found those same amorous blue eyes on her and was trying hard to evade them, meanwhilst her sister had given birth to her first child a daughter whom she named possibly after the queen, maybe out of guilt who knows but the question of their parentage has been a matter of debate for many years, the grants that Claire mentions cannot be taken as proof that Catherine was his as he made grants to many, and as she says the same names do pop up, Henry was born later yet debate has raged about him all because his mother once had an affair with the King, both Catherine and Henry have many descendants and most of them believe that Henry V111 was their father, but there is none and never will be any proof that he was, Catherine does seem to resemble Henry V111 yet William Carey was a cousin of his so that could well explain the resemblance, but she has a full face in the portrait said to be of her when she was pregnant, and she does look more like the King than Carey, the auburn hair is very telling yet was Marys auburn or Cary’s? we do not have any description of her looks unfortunatly only of her so called lack of morals, her sister Anne was a brunette with an olive complexion, we do not know her parents colouring or her brother Georges, I always imagined he was dark like Anne he was said to be a womaniser, but all we know is he was called a young Adonis which means very handsome, if Mary or her husband was auburn haired then it would explain her daughters colouring, there is as the video says her children’s long favoured association at the court of Elizabeth, and the deep affection the queen held for them, again it is mere conjecture that her affection was due to them being her half siblings, I believe it was more to do with them being her mother’s blood kin and the closeness was because of the loss of the mother she had never known, I do not believe Henry was the Kings son but yes his sister could have been his daughter, but Henry was born after his mother’s marriage and by then Anne was being courted by the King, there are so many stories that have abounded about the Boleyns and the ones stated in the video we can dismiss as just character assassination because they were biased, just as Sander himself wrote nearly fifty years later when all of Anne and Marys contemporaries were dead, Anne was turned into a buck toothed wicked unchaste woman who had indulged in incestous love and the result was a shapeless mass of flesh, Mary was a great prostitute and their mother no better, a biased Catholic opinion on an evil family who had caused the dreaded reformation, Mary was only ever associated with two kings and then she married, she lost her husband and found life a struggle, she then married for love, she appears neither wicked nor immoral, as iv said earlier, it must be very hard to say no to your King when you are in his power and you are a young girl at court, in truth was not the blame with these two kings? They were the ones in the position of power, they had the power over life and death, Henry V111 put a lot of pressure on Anne, Mary it appears had not her strength of character she could have been frightened into capitulation, after all how do we know she was their willing mistress ? Mary loved her children and married William Stafford, she was no doubt a good wife to him like she must have been to Carey, a lot of ribaldry and gossip has been said about her due to the fact that her life was essentially a mystery, she is made out to be what we would call today a good time girl, the truth is she could have been very different and she deserves a much fairer opinion of her very nature and her life, sorry for going on so much but I find sometimes I do get carried away.